Welcome to the final post in our 3-part MongoDB 3.2 blog series. In part 2 we covered features designed to support mission-critical applications, including document validation and the enhanced replication protocol. In this post, I’ll provide an overview of new tools and integrations supporting data analysts, DBAs, and operations teams. Remember, you can get the detail now on everything MongoDB 3.2 offers by downloading the What’s New white paper. With MongoDB deployed across a wider range of an organization’s application portfolio, data analysts, DBAs, and operations teams will need to integrate MongoDB within their existing processes and tool sets. MongoDB 3.2 allows analysts to support the business with new insights from untapped data sources, while DBAs and Ops teams are able to operationalize MongoDB alongside existing relational databases, protecting existing investments in management platforms and skillsets. ### MongoDB Connector for BI Driven by growing requirements for self-service analytics, faster discovery and prediction based on real-time operational data, and the need to integrate multi-structured and streaming data sets, BI and analytics platforms are one of the fastest growing software markets. To address these requirements, modern application data stored in MongoDB can for the first time be easily explored with industry-standard SQL-based BI and analytics platforms. 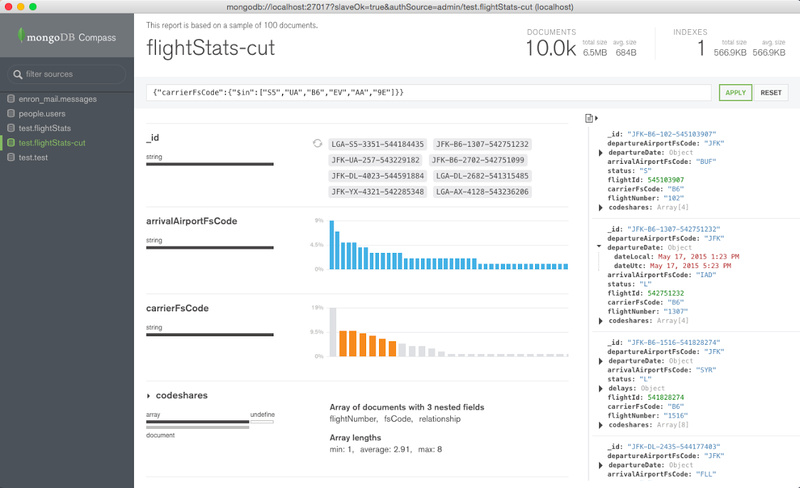 Using the MongoDB Connector for BI, analysts, data scientists and business users can now seamlessly visualize semi-structured and unstructured data managed in MongoDB, alongside traditional data in their SQL databases, using the same BI tools deployed within millions of enterprises. Applications get great efficiency from MongoDB by combining data that is accessed together into a single document. In contrast, a typical relational database schema scatters related data across scores of tables – e.g., a blog site that stores every tag, category, comment, author and callback as rows in separate tables from the blog post they’re associated with. MongoDB 3.2 introduces the ability to combine data from multiple collections by implementing left outer joins through the $lookup operator, which can now be included as a stage in a MongoDB Aggregation Framework pipeline. The new $lookup stage provides more flexibility in data modeling, and allows richer analytics to be run with higher performance and less application-side code. You can learn more from the documentation and see worked examples in this series of blog posts. 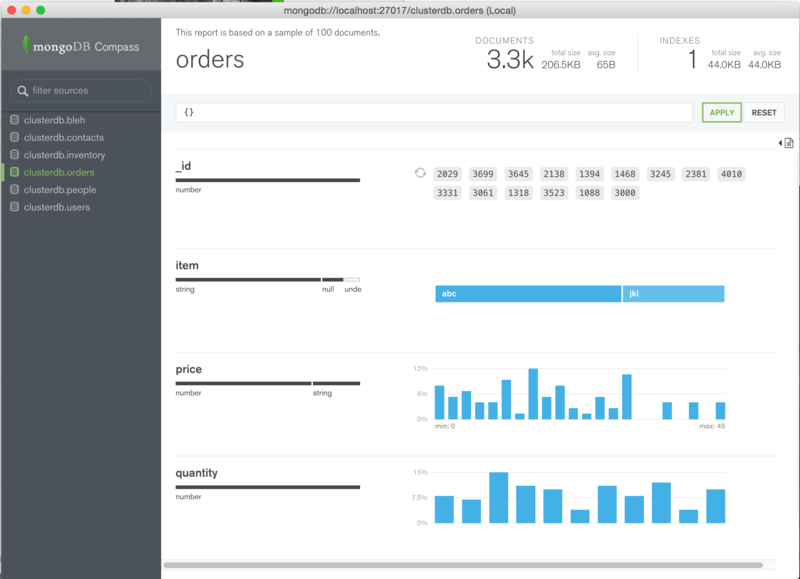 MongoDB 3.2 extends the options for performing analytics on live, operational data – ensuring that answers are delivered quickly and simply, and are based on current data. Work that would previously have needed to be implemented in client code can now be performed by the database – freeing the developer to focus on building new features. The aggregation pipeline is a powerful way to perform complex analytical queries on MongoDB data. Aggregation pipeline stages allow manipulation of a "stream" of documents from a collection that can either be returned via a cursor to the client (similar to find), or be stored in a new collection via a final $out stage. When analyzing very large data sets, it is frequently sufficient to look at a random sample of documents rather than all of the data. For example, if you wanted to compare the number of check-ins to coffee shops to those at bars, you can get a good approximation without searching through every single check-in. Previously, this sampling would have to have been implemented in the application, but MongoDB introduces the $sample operator, which can be included at any point in the aggregation pipeline. MongoDB documents can store arrays as well as simple values. While this feature is very expressive and powerful, without the corresponding ability to manipulate and filter arrays in documents during aggregations, their usefulness has been limited in an analytical context. New operators have been added to allow more flexibility when dealing with arrays: $slice, $arrayElemAt, $concatArrays, $isArray, $filter, and $min. New mathematical operators have been added for operations such as truncate, ceiling, floor, absolute, rounding, square root, logarithms and standard deviations. These operators can be used to move code from the client tier directly into the database, allowing higher performance with lower developer complexity. By combining the new and existing operators aggregation pipelines can be built to generate sophisticated results with a single query. Review the documentation to learn more about all of the aggregation pipeline enhancements. Text searches on the data in MongoDB can either be performed in the database or by an external search engine. Performing the search within the database is more efficient and simpler to administer, so that is the preferred option whenever possible. MongoDB 3.2 increases the set of use cases that can be met with in-database text searches by adding support for case-sensitive searches, as well as additional languages including Arabic, Farsi, Urdu, Simplified Chinese, and Traditional Chinese. To provide support for these languages, MongoDB Enterprise Advanced provides integratation with Basis Technology Rosette Linguistics Platform (RLP) to perform normalization, word breaking, sentence breaking, and stemming or tokenization depending on the language. More information on text search enhancements can be found in the documentation. MongoDB’s dynamic schema and rich document model make developers more productive, but they also make it difficult to explore and understand the underlying data and its structure – in particular for non-developers who aren't familiar with the MongoDB query language. The MongoDB Compass GUI allows users to understand the structure of data in the database and perform ad hoc queries against it – all with zero knowledge of MongoDB's query language. Typical users could include architects building a new MongoDB project or a DBA who has inherited a database from an engineering team, and who must now maintain it in production. They need to understand what kind of data is present, define what indexes might be appropriate, and identify if Document Validation rules should be added to enforce a consistent document structure. Until now, users wishing to understand the shape of their data would have to connect to the MongoDB shell and write queries to reverse engineer the document structure, field names and data types. Similarly, anyone wanting to run custom queries on the data would need to understand MongoDB's query language. MongoDB Compass provides users with a graphical view of their MongoDB schema by sampling a subset of documents from a collection. By using sampling, MongoDB Compass minimizes database overhead and can present results to the user almost instantly. As illustrated in Figure 3, a query can be built and executed by simply selecting document elements from the MongoDB Compass user interface. By selecting multiple values, sophisticated queries can be built. The query can then be executed at the push of a button and the results viewed both graphically and as a set of JSON documents. MongoDB Compass samples the database to provide a fast, interactive experience no matter how large the database. If the full results are needed then the query can be simply copied and pasted into a MongoDB shell window. To evaluate MongoDB Compass, head to the MongoDB Download Center. MongoDB Ops Manager and Cloud Manager are the best way to run MongoDB, reducing tasks such as deployment, scaling, upgrades and backups to just a few clicks or an API call. Operations teams can be 10-20x more productive using the Ops or Cloud Manager platforms. Create point-in-time, consistent snapshots of the database on standard network-mountable filesystems, and restore complete running MongoDB clusters from backup files. Many operations teams use Application Performance Monitoring (APM) platforms such as New Relic and AppDynamics to gain global oversight of their complete IT infrastructure from a single management UI. Issues that risk affecting customer experience can be quickly identified and isolated to specific components – whether attributable to devices, hardware infrastructure, networks, APIs, application code, databases and more. The MongoDB drivers have been enhanced with a new API that exposes query performance metrics to APM tools. Administrators can monitor time spent on each operation, and identify slow running queries that require further analysis and optimization. In addition, Cloud Manager will provide packaged integration with the New Relic platform. Key metrics from Cloud Manager are accessible to the APM for visualization, enabling MongoDB health to be monitored and correlated with the rest of the application estate. As shown in Figure 4, summary metrics familiar to Cloud Manager users are presented within the APM’s UI. Administrators can also run New Relic Insights for analytics against monitoring data to generate dashboards that provide real-time tracking of Key Performance Indicators (KPIs). If the operations team needs finer grained telemetry, they can drill down into the 100+ system metrics maintained by Cloud Manager. For example, the new visual query profiler helps diagnose slow running queries, which can then be resolved by adding a new index and automatically deploying that across every node in the cluster. The MongoDB database profiler collects fine-grained information that can be used to analyze query performance. However, the output could be difficult to parse, making slow running queries difficult to correct. In addition, the profiler had to be individually activated for each MongoDB instance, and the output manually aggregated from every node to provide a holistic view across the entire deployment. Delivered as part of Ops Manager and Cloud Manager, the new Visual Query Profiler provides a quick and convenient way for operations teams and DBAs to analyze specific queries or query families. The Visual Query Profiler (as shown in Figure 5) displays how query and write latency varies over time – making it simple to identify slower queries with common access patterns and characteristics, as well as identify any latency spikes. 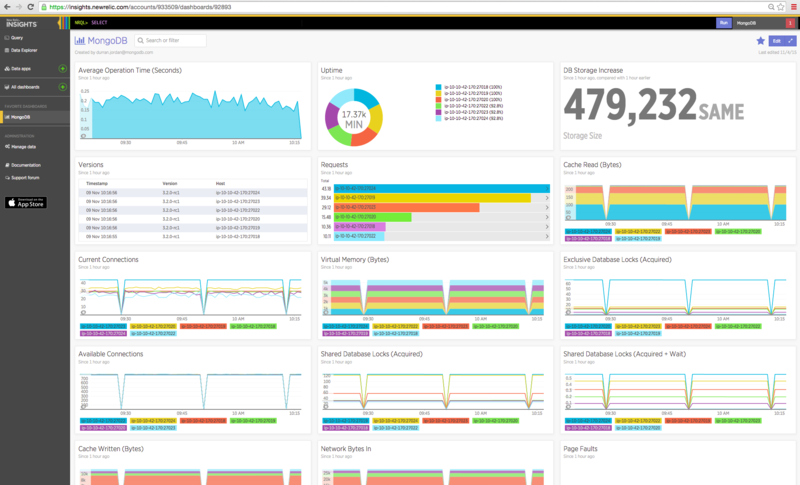 A single click in the Ops Manager UI activates the profiler, which then consolidates and displays metrics from every node in a single screen. Further simplifying operations, the visual query profiler will analyze data it collects to provide recommendations for new indexes that can be created to improve query performance. Once identified, these new indexes need to be rolled out in the production system. In order to minimize the impact to the live system, the best practice is to perform a rolling index build – starting with each of the secondaries and finally applying changes to the original primary, after swapping its role with one of the secondaries. While this rolling process can be performed manually, Ops Manager and Cloud Manager can now automate the process across MongoDB replica sets, reducing operational overhead and the risk of failovers caused by incorrectly sequencing management processes. Partial indexes balance delivering good query performance while consuming fewer system resources. For example, consider an order processing application. The order collection is frequently queried by the application to display all incomplete orders for a particular user. Building an index on the userID field of the collection is necessary for good performance. However, only a small percentage of orders are in progress at a given time. Limiting the index on userID to contain only orders that are in the “active” state could reduce the number of index entries from millions to thousands, saving working set memory and disk space, while speeding up queries even further as smaller indexes result in faster searches. By specifying a filtering expression during index creation, a user can instruct MongoDB to include only documents that meet the desired conditions. When performing the database find operation, the application should include the value being used for the filtering as well as the indexed value in order for the partial index to be used by the optimizer. Review the documentation to learn more. Beyond the functionality discussed above, a number of enhancements improve productivity of Ops teams and simply installation and management. Ops teams can now automate their database restores reliably and safely using Ops Manager and Cloud Manager. Complete development, test, and recovery clusters can now be built in a few simple clicks. Integrating with existing storage infrastructure, MongoDB backup files can now be stored on a standard network-mountable file system. Operations teams can configure backups against specific collections only, rather than the entire database, speeding up backups and reducing the requisite storage space. This enhancement is also available in the Cloud Manager platform. Installation and configuration of all application and backup components can now be made through the centralized Ops Manager UI, which also provides a single, at-a-glance dashboard for health monitoring. Enhancements to the backup architecture provide faster time to first database snapshot. Eliminating false alarms, maintenance windows can now be defined during which Ops Manager and Cloud Manager alerts will not be triggered. From APM integration through to profiler visualization with index suggestions and automated rolling index builds, through to platform simplification and automated cluster restores, Ops Manager can make your teams more productive. New storage engine options, coupled with document validation, the enhanced replication protocol and sharding improvements extend the range of mission-critical applications MongoDB can serve. New tools such as the BI Connector, Compass, and Cloud Manager integration to APM platforms allow organizations to take advantage of MongoDB while protecting investments in existing frameworks and workflows. Remember, you can get the detail now on everything MongoDB 3.2 offers by downloading the What’s New white paper. Evaluate MongoDB Enterprise, along with the Connector for BI, MongoDB Compass and Ops Manager by heading to the MongoDB download center.